Acne is the most frequently diagnosed skin condition in the United States. It is characterized by pimples that appear on the face, back and chest. 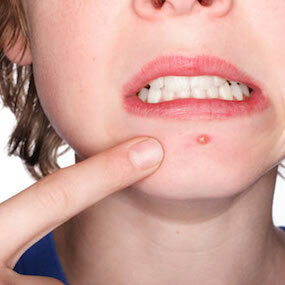 Every year, about 80% of adolescents have some form of acne and about 5% of adults experience acne. Whiteheads/Blackheads, also known as comedones, are non-inflammatory and appear more on the face and shoulders. While they can lead to scarring, it is unlikely as long as they remain uninfected. Red Pustules or Papules are inflamed pores that fill with pus and these can lead to scarring. With acne, the structure through which the sebum flows gets clogged. This blockage traps sebum and sloughed-off cells below the skin, preventing them from being released onto the skin’s surface. If the pore’s opening is fully blocked, this produces a whitehead. On the other hand, if the pore’s opening is open or partially blocked, this produces blackheads. When either a whitehead or blackhead becomes inflamed, they can become red pustules or papules. Benzoyl Peroxide: Used in mild cases of acne, benzoyl peroxide reduces the blockages in hair follicles.